Collaborative and Creative Learning Environments – Teach It! Tech It! Learn It! Lead It! I have been reading a lot lately about Stanford’s D.School on Fast Company’s Blog. The posts I have been reading have gotten me thinking a lot about classroom environments and school building architecture in general. Bottom line: it’s safe to say that students can optimize their thinking, learning, and sharing to the maximum in an environment that fosters collaborative and creative thinking; like the D.School at Stanford. Research shows that their is a correlation in facilities and student achievement (Uline & Tschannen-Moran, 2008). I hope that school administrators and other key stakeholders understand the importance to get rid of drab musty buildings and replace these outdated facilities with state of the art, collaborative, technology laden learning environments. 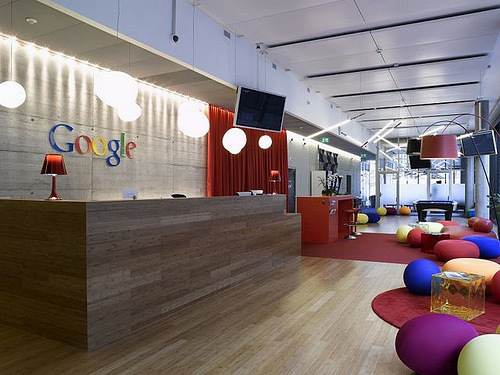 I remember my trip the the Google Offices in Boulder, CO for the Google Teacher Academy in 2009. The work environment was like nothing I have ever seen before. I walked away thinking about how stinking cool it would be to have a classroom designed like that! Climbing walls, Rock Band, Big Bean Bags, Healthy brain food, reliable wireless networking, giant monitors, adjustable desk…oh to have fountains of money and no limitations for building! So start slathering on that IDEA PAINT and rethinking classroom, and building, design any way you can! ← How Fast Is Google Chrome?